Well, folks - there's been much demand for an addition to the UnOfficial 81st website. . something along the likes of comparing photos of us as we were. . back then. . versus - us. . now. Yes.. it's a crazy notion that makes you giddy with smiles & is yet so frightening at the same time! Unfortunately, time is not on our side & thus this is another mission of the website. . to somehow bring us all together in cyberspace. . to fold space so-to-speak & meld the past into the future. . which is NOW! WOW!! Now - this only works with contributions from. . yes, you readers & viewers out there! So, if you've enjoyed this page - contribute! To get started, email the webmaster at [email protected] . Get involved 81st! It seemed only natural that I.. the webmaster & yours truly.. Ken Kern.. gulp.. go 1st. &, so with great trepidation.. rather, honor. Here I am! Left pic is me in 1980.. right pic is me - OK, well it's not entirely recent, but add some gray hair, a few more wrinlkes & presto! I'm currently & have been for many years, a law enforcement officer. I'll leave the specifics off the website, but if anyone is interested write or chat with me & I'll fill you in with the details. It's been an honor creating & maintaining this website for you all. It truly has been a labor of love.. & one that has brought & will bring back together long lost friends. The 81st spans 5 decades of rich history at the old RAF Woodbridge & Bentwaters bases. . let's cherish the memories & share our stories together. Hi, I'm Terry Carr. 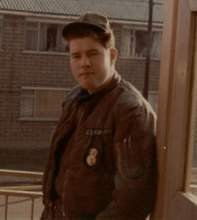 "TC" while at Bentwaters from May 68 to May 71. Three yrs of work, fun & travel. London was home away from home. Never did much in Ipswich except catch the 6: 28pm train for London. I was in D flight & since I could type- worked in the SAS & Com-plotter areas. The last 6 mos. was with B flt LE at Woodbridge. I arrived with 1 stripe & left a SSgt. Not too bad I guess. 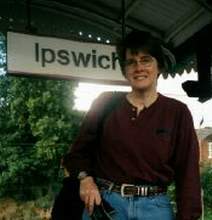 The NOW pic to the right was taken at the train station in Ipswich. I had the greatest pleasure of returning after 30 yrs! Linn Barranger was great & we had a wonderful time. My family and I miss England & Scotland, and are already planning a return trip. I am a chiropractor with my wife in a small Wisconsin town. I was a firefighter/ paramedic for 12 years & a reserve deputy on the sheriff's dept for 3 years. I hope to hear from some old friends. wearing men's pants since I tore up a bunch of pants climbing through unsecured windows and clothing sales didn't sell many women's items and I'm wearing men's corafram shoes since they were shinier and kept me out of trouble. Okay, I was breaking the rules back then. I was probably also on a serious diet thinking about chocolate. The picture on the right is of me last year after a long flight and train ride. I just pulled into Ipswich all tired and feeling as if I fell into a dream. I never thought I'd find myself wanting to visit RAF Bentwater's and RAF Woodbridge. I have a silly 'take the picture now so I can get off the bench' look on my face. Hi.. this is Ron Mele. That's me on the left as a one striper (duh!) doing desk clerk duties. Made the mistake of typing out a statement on some incident.. Keith Turner hired me as the desk clerk the next day! This is Tim Egercic. 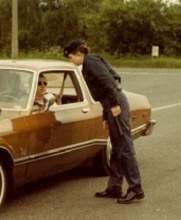 I'm originally from Western Pennsylvainia and I was stationed at RAF Bentwaters from Mar 1979 to Mar 1981. 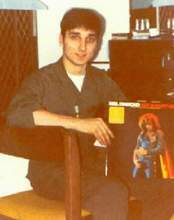 On the left is me when I was 20 holding a Neil Diamond album (remember those?) in my old barracks room in dorm 754. Behind me is my stereo (I still have those speakers btw) and a large bottle of bourbon from the Class VI. 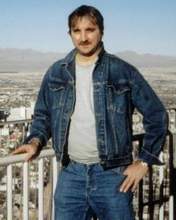 On the right is me on top of the Stratosphere Tower in Las Vegas, NV. I make 3 to 4 trips a year to Las Vegas which happens to be my favorite vacation spot. After Bentwaters, I got stationed at Seymour-Johnson AFB, NC.. got out after 4 years in Nov 1982. 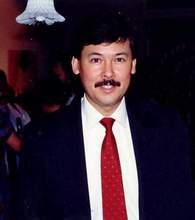 I've been employed by Electronic Data Systems since 1984 working in Camp Hill, PA and Plano, TX just north of Dallas. 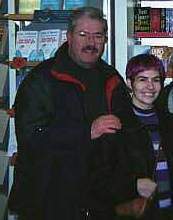 In Apr 2002, I had another memorable time at Bentwaters visiting the base with some former SPs and friends (Ken Greene, Tony Invergo, and Don Laisure), Tony's family and two local British residents (Linn Barringer and Jon Saunders). See the pictures and read all about it on this website.